By Jordan Wathen. September 2, 2013. ... when you look at a chart of home sizes by year, they seem to be inversely related to interest rates. As interest rates fell in the late 1970s, home sizes grew. 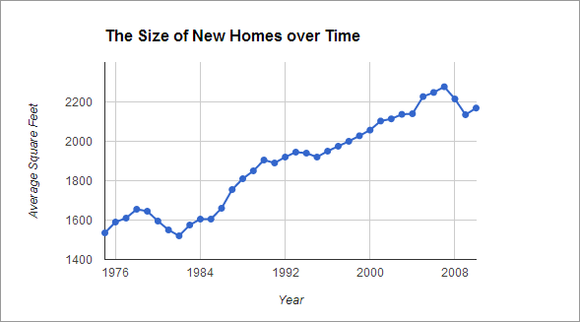 As rates rocketed in the early 1980s, home sizes contracted. After reaching a peak in the 1980s, mortgage rates have fallen precipitously, and homes have grown in almost every single year since. While it's likely renters feel cramped in smaller apartments, it's unlikely future homebuyers will need a subprime boom-style McMansion after moving out of a rented apartment space. (WASHINGTON, D.C. – August 27, 2013) The Building Owners and Managers Association (BOMA) International, using the results from the 2013 Experience Exchange Report® (EER), compiled a list of the most and least expensive commercial real estate city-markets in the United States. The annual report aggregates rental income and operating expense figures from the previous year; in 2012, data was gathered from more than 5,300 buildings across 250 markets and 115 cities in the United States and Canada. Not surprisingly, New York City's total operating expenses topped the chart at $11.80/sq ft. Nashville's were the lowest at $5.69. For a company whose showrooms are all online, Amazon.com (AMZN) spends a staggering amount on bricks and mortar. 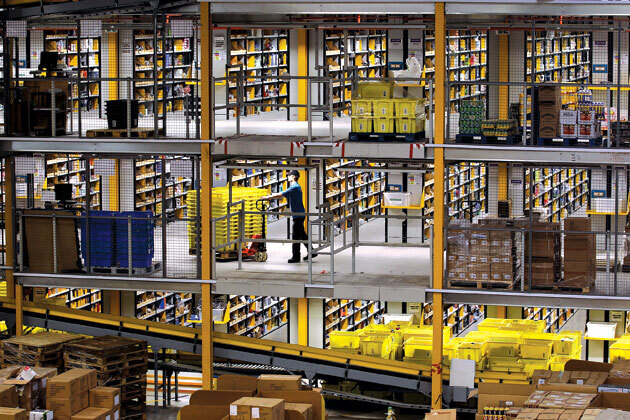 The e-commerce giant has invested roughly $13.9 billion since 2010 to build 50 new warehouses, more than it had cumulatively spent on storage facilities since its 1994 founding, bringing the total to 89 at the end of 2012. (It's announced five more in the U.S. this year.) Amazon aims to be able to deliver most items the day they're ordered, so it can keep rivals such as EBay (EBAY) and Wal-Mart Stores (WMT) from peeling off customers. EBay offers same-day delivery in some cities, and Wal-Mart is moving more sales online. "What Wal-Mart and EBay are working on is, can they be faster than Amazon?" says Wells Fargo (WFC) analyst Matt Nemer. "It might not be the highest-margin sale in the world, but they can potentially get something to you in an hour." LaTanya Moore-Newsome, a real estate agent with Century 21 in Atlanta, has been calling Wall Street-backed landlords for months on behalf of her low-income clients with government housing vouchers. She said some of the area's biggest homebuyers in the past two years, including Blackstone Group LP (BX), American Homes 4 Rent and Silver Bay Realty Trust Corp. (SBY), repeatedly told her they had nothing available for tenants who use subsidies under the federal Section 8 assistance plan. Last week, she finally got a positive response from Blackstone's Invitation Homes unit, which said it would accept applications from her renters. Some institutional landlords, including Waypoint Homes Inc. and Sylvan Road Capital LLC, consider voucher holders a reliable client base because they have a low turnover rate and the government pays most of their rent on a timely basis. Other investors that are building home-rental companies may not want to take on the red tape, stigma of renting to poorer tenants and the potential extra costs, said Christopher Thornberg, principal at research firm Beacon Economics LLC in Los Angeles. They also don't want to leave their homes vacant for long, he said. Investors are buying houses for the potential value appreciation as much as the rental cash flow, and may be reluctant to commit to Section 8 tenants because those leases come with long-term constraints that reduce the ability to sell quickly, according to Raphael Bostic, assistant secretary for policy development and research at the U.S. Department of Housing and Urban Development from 2009 to 2012. With a glut of properties to fill, investors that shun some of the 2.2 million Americans with federal vouchers in certain regions risk higher vacancy rates and lower yields, according to Jeff Pintar, CEO of Pintar Investment Co., which has invested more than $1.5 billion in single-family properties. "If you're an investor in t he markets that have Section 8 housing as a predominant portion of the community and you're not accepting vouchers, you'll have a bigger difficulty getting that property leased," said Pintar, who manages more than 2,500 homes in Southern California, Las Vegas and Atlanta, with about 15 percent occupied by Section 8 tenants. "It's sort of gotten the connotation of poor people of color moving into my neighborhood," Popkin said. "But the research we've done and other people have done is that there's no evidence they bring crime to a community. There's no evidence they hurt property values." One firm that's welcoming Section 8 tenants is Oakland, California-based Waypoint. About 5 percent of the almost 4,000 houses the firm owns were leased to Section 8 tenants, according to a July regulatory filing. Waypoint has asked the Housing Authority of the County of Los Angeles how it can get approval for "hundreds" of homes in the district, said Emilio Salas, deputy executive director for the agency, which has almost 23,000 vouchers. "From a purely cash flow circumstance, Section 8 is better than having a market-rate tenant," Brock said. "Our tenancy is longer, our collections are lower and our delinquencies are fewer. We get paid on time." Investors with more experience in the single-family-rental sector typically say that renting to Section-8 tenants is a positive experience in general. This entry was posted in General Real-Estate News, News-Alerts Digests. Bookmark the permalink.